My 2018 traditional Les Paul has developed this milky hue on the bridge and tail piece ? I can wipe it off and wipe it off but it always returns ? Last 3 times I haven't even touched it, ive wiped it off each time and it is quite hard to remove, it has just been sat in the case each time, i have also left it out of the case to but it still re-appears ? lts hardly been played and only comes out occasionally, has anyone any ideas what could be causing it it's driving me mad, no other guitar does it, my other Les Pauls are fine and shiny. Nickel hardware just tends to dull like that. Perhaps your other guitars have chrome hardware? AHH that may be a good point? My other Gibson Les Paul doesn't do it though, my epiphone doesn't do it, high end tokai doesn't, nor does my prs ? Would these be chrome plated ? I also upgraded the bridge on this to a Faber abrh 59 which I believe is nickel plated to, it's just weird how my other traditional Les Paul doesn't do it ? Which also has Faber fitted, if it's normal I can live with it, cheers for the reply. Also depends on the plating quality and roughness. Gibson has been using nickel hardware on the Traditional since 2017. That would explain it then thankyou, my other traditional is a 2016. Yup, it’s a nickel hardware thing. You can polish it out, but on collectible Gibsons, it's a mark of the vintage. Nickel was the plating type before chrome became popular and cheap enough to use,... So it's a "traditional" old school look that does indeed tarnish. I happen to like both,... but not mixed on the same guitar, either Chrome or Nickel. Chromium is a resource that is abundant in Africa, Turkey, and India,... not so much in the USA. That’s why nickel was used in the early years,.... USA sourced making it cheaper to plate with. I'd try wiping on a thin coat of wd-40 (or similar product). let that finish yellow a bit more,dont wipe the tailpiece...that looks the buisness. To me, the look of tarnished nickel beats regular chrome. Actually it might be indicative high moisture content in the air. Nickel seems to attract moisture quicker than other platings. And it will start to oxidize if left there. Any idea what your humidity level is? A little lemon or mineral oil would provide a good barrier. It's probably where you rest the palm of your hand. If it bugs you get a tube of metal polish, I got some from a motorcycle supply for about $8, it will shine that right up. Edit: actually probably where your forearm hits the TP, not your palm. Whatever, it can most likely be polished away with the metal polish if you want. Everyone else nailed it. Nickel hardware, and nickel will almost always do this. You'll pay more for aged nickel hardware, like Faber and Callaham. I like it aged, but not all do. 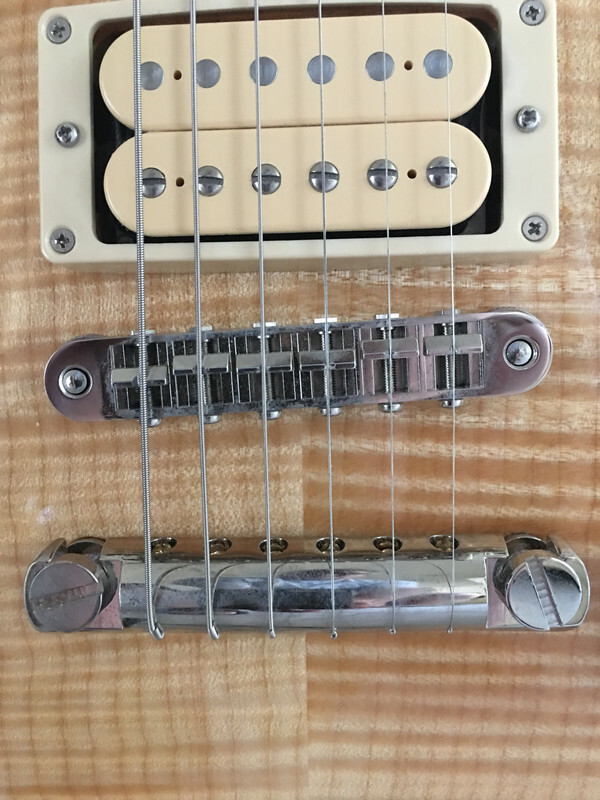 You can replace the bridge and tailpiece with chrome if you like. Up to you. Thanks for the help and responses everyone, glad to know it's a normal ocurance then, I do like worn or aged looking guitars but because the pick up covers are shiny and still look like new it looks a little odd to me, with uneven wear ? I can live with it no worries now I know it's normal, I might just have to invest in some new distressed pickups like SD antiquities, again thank you everyone. I think it’s aging very nicely! Get some metal polish. Bam! Looks like new again with a tiny bit of elbow grease. Or leave as-is. Bam! Instant mojo. Metal polish gets the crud off, but still leaves some "old nickel mojo" to the metal.